The Larson Electronics MGL-15KVA-480.3P2X480.60-6X120.20 Temporary Power Distribution System converts 480 VAC current to single phase 480V AC and 120V AC 60hz. This power distribution system provides operators the ability to safely tap into and distribute 480VAC power from a variety of sources including generators and direct grid power. This portable substation is suitable for outdoor applications with a fully potted transformer and NEMA 3R load center. This unit features a built-in cord wrap for a customer provided cable and a top located eyelet for picking. The MGL-15KVA-480.3P2X480.60-6X120.20 temporary power distribution system provides a safe and reliable way for operators in industrial settings to tap into and utilize power sources independently of the work area. This unit provides an effective power distribution system for operators performing plant turnarounds, maintenance and cleaning in hazardous areas, equipment installations and repairs, and any activities requiring an alternative to native power sources. This portable transformer is designed to operate with 480V, three phase, 60hz which it then steps down to 208Y/120 three phase. The power distribution system on this portable substation makes 480V AC available via two 60-amp, ADR6034 receptacles and 120V via six 20-amp, GFCI protected quad outlets. All receptacle device boxes are industrial die cast malleable iron construction and feature weatherproof covers. Equipped with a 15KVA potted NEMA 3R transformer, this system takes 480V on the primary side and converts it to 208Y/120V three phase power. Operators can access this power via two 480 Volt, 60-amp ADR6034 receptacles and six 120 Volt, 20-amp GFCI protected quad outlets. 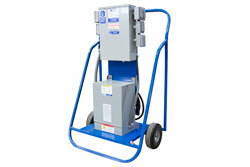 A cord wrap is built into the frame, allowing operators to store up to 200` of operator provided cable on this unit. A customer provided cord is needed to provide 480 Volt service. 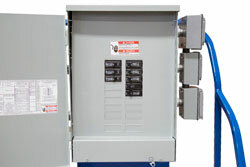 A 125-amp main lug on the primary side with two 60-amp and one 20-amp breakers protects the 15KVA potter transformer. 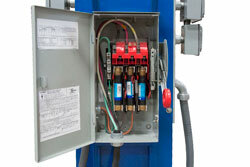 The transformer feeds a 100-amp main lug secondary panel that includes six 20-amp 120V breakers. 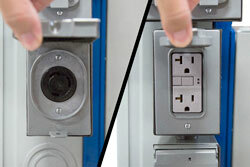 The breakers feed the six GFCI protected quad outlets. This wheeled unit sits on a powder coated steel frame with run-flat wheels. Operators tilt the unit back to maneuver the unit and place it upright to stabilize the system. Operators can lay the unit parallel to the ground and pass this power distribution system through a 24-inch square man-way. This power distribution system measures 23 inches square by 56 inches tall. The transformer and load center/distribution assembly is mounted to a standard steel cart style frame resulting in an extremely stable, durable, and mobile power distribution platform. Two rubber tires and a cart style mounting platform provides easier substation mobility, and a center point lift pickeye allows easy lifting with cable or chain hooks. 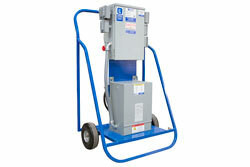 This temporary power distribution solution can be modified to meet the needs of job-site receptacle requirements. 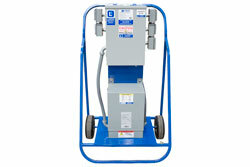 Units are available up to 150 KVA, and can be equipped with skids or trailer mounted. This power distribution system is UL 1640 and NEMA 3R rated and ideal for indoor/outdoor use and applications including but not limited to; construction sites, plant maintenance, plant turnarounds, hazardous location operations, shows, exhibits, and shipyard operations. These temporary power distribution systems are popularly used for industrial applications where external power sources are often necessary and work well in combination with explosion proof lights and equipment.